Hark the Herald Angles Sing... Joy to the World... Rudolph the Red Nosed Reindeer had a very shiny nose.... Jingle Bells, Jingle Bells... One of the most magical aspects of this upcoming Holiday Season is the singing of carols and how from young to old it can add cheer to your season! Taking a 'note' from this love of singing Christmas Carols... and the love of Christmas Trees to create this pretty hand-stamped Christmas card that is sure to make someone's heart sing! 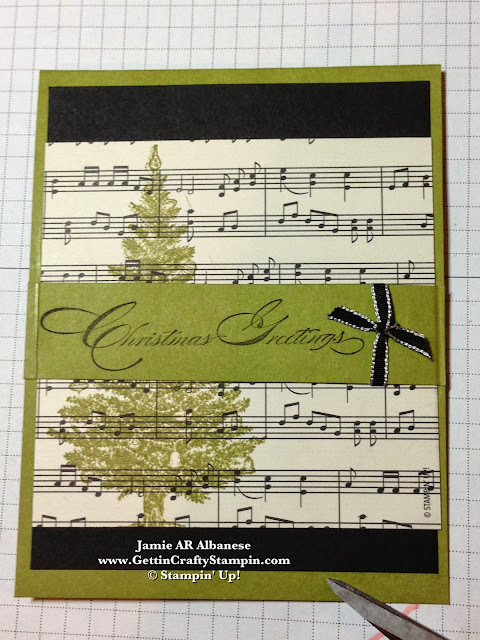 This fun and quick card is a great way to make the holidays sing! 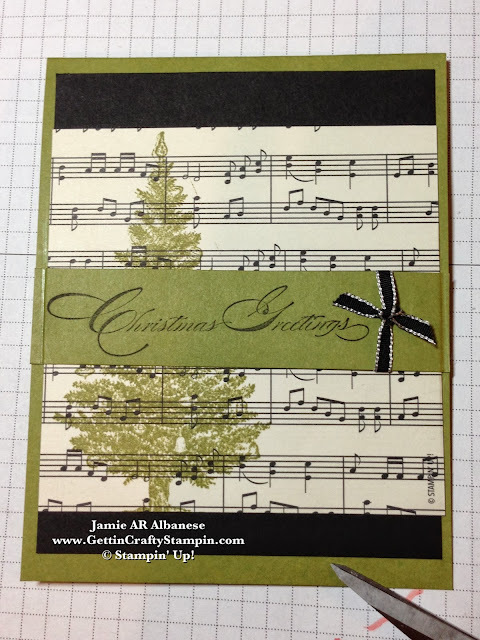 Stamping this tree from the Special Season on this music printed page from the Modern Medley Designer Series Paper. Layer on the Black card stock 'frame' to allow for a 'break' in the card. Stamping this Christmas Greetings scrolled sentiment from the Special season stamp set with Black ink on the Old Olive card stock. Tie this little knot with the Black Taffeta ribbon. Adhere with SNAIL Adhesive to the top of the card. Using my Bone Folder (#102300) I pressed the sides of the Christmas Greetings sentiment down for a beautiful shaped band. This subtle technique really adds to the card. Creating a QUICK hand-stamped card doesn't detract from it's beauty. Hand-stamped cards don't have to be elaborate to say you care! I'm so glad you popped by today! Come and visit often! I try to post daily fun tutorials. Bring your friends and family along for the fun, too! Join me in preparing for the Holidays with my many classes and clubs! Go ahead, no matter how off-key, sing this holiday season! Send cards, too, to those who need their heart to sing! Hand-stamped cards show that you care and we all need to know how special we are! So, have a Happy Holiday Season and know that I think you are just the bees-knees!